These new technologies, including electronic and video hand hygiene monitoring systems, have the potential to provide continuous and objective monitoring, as well as regular feedback. With some of the monitoring systems, sensors in personnel badges and dispensers enable hygiene activity to be captured without changing workflow. New and existing hygiene dispensers are fitted with smart sensors that capture personal usage data. Some of the systems also provide real-time reminders to staff such as a vibration if a healthcare worker enters or exits a patient’s room without activating the soap dispenser. These reminders address the issue of workers saying, “I forgot,” which has been identified as a common reason given for failure to wash hands. Electronic monitoring systems vary from simple systems that track only the number of times that soap or hand sanitizer is dispensed, to more complex systems that combine information on the timing of hand hygiene dispensing and the location of a healthcare worker to provide an estimate of compliance. The systems eliminate the troublesome issues with human observation. The primary objective is to determine whether hand hygiene monitoring systems yield maintainable improvements when compared to current programs. Hicks is an advocate of the systems. The most exciting potential benefit of these systems is that they may be effective in improving hand hygiene compliance and reducing the incidence of HAIs, which is, of course, the goal of all hand hygiene programs. For example, this technology may create an enhanced Hawthorne effect as healthcare workers realize that they are being monitored on a continuous basis. There should be no downside as the monitoring doesn’t stop. Also, workers can receive more frequent and individualized feedback, which should improve compliance. Cost is always a factor for healthcare facilities that are watching their margins, and the electronic monitoring systems are not inexpensive. Currently, only about 3 to 5 percent of hospitals are looking at electronic solutions, says Mann, who regularly consults with hospitals on the problem of noncompliance. In terms of what it costs to treat HAIs, however, the systems are worth it, Mann says. The overall annual, direct medical costs of an HAI to U.S. hospitals ranges from about $28 billion to $45 billion. Compared to the benefits of prevention, which range from a low of about $6 billion to a high of $31 billion, according to the CDC. But education alone isn’t enough. 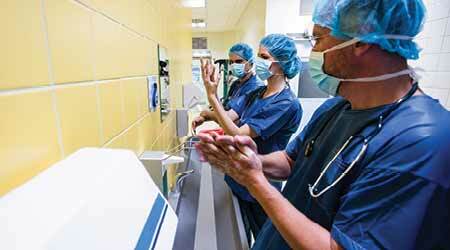 Working to change a hospital’s entire safety culture and to make hand hygiene a priority from an entire organization is the wisest route to take. JOANN PETASCHNICK is a freelance writer based in Milwaukee, Wisconsin.